Thank you for your interest in Reflexology! Hands, feet and ear lobes represent energetically the ‘maps’ of all body parts and systems (nervous, reproductive etc.). Reflexology consists in pressing or massaging the points or areas on those parts of the body, which represent specific organs and systems, in order to induce or support their natural healing processes. I find it fascinating that we are naturally or divinely designed to enhance reflexologically our whole body healing by literally every step which we might make barefoot, and also by pressing the palms of our hands while engaging in some physical activity, like climbing and handling tools. That natural reflexological effect is greatly diminished by our footwear that prevents to a large degree our feet from being naturally massaged and reflexologicaly activated. Using our hands with minimal physical pressure has the same effect of decreasing substantially their healing reflexological potential. I was introduced to the delights of earlobe massage by my young son who asked me for it as his favorite treatment years before either of us learned about Reflexology. Children tend to be in touch with their natural body wisdom and respecting it it helps them heal naturally. 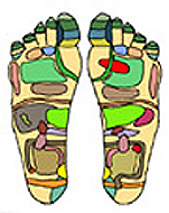 Reflexology can help heal naturally various physical and physiological conditions. Given the intrinsic mind-body inter-relatedness, psychological issues can be helped by reflexology as well. At one stage of my healing I experienced foot reflexology as helpful to heal from some past life issues as well. Reflexology on healthy feet, hands and earlobes is deemed compatible with other forms of healing - medical, traditional, complementary and self-healing.